A Whiff of Spice: The summer that was! I have been planning my to-do list for summer since March. I was brimming with ideas for the blog and fun activities for the kid. But nothing happened. The closest thing I did was to freeze store bought fruit juices in popsicle molds. We moved to a new house. We are still renting but its a bigger place and a better school district. When we first came to this country almost 4 years ago, we barely had a week to scout for a place to stay. We were naive and rented the first place we ever saw; a tiny 850 sq ft 2 BHK with 1 full bath. With a 2 year old, 6 suitcases and no furniture, that place seemed more than enough. 4 years later we were fighting every single morning for the bathroom and couldn't move an inch without bumping on to something. And it wasn't the best school district either. A good portion of the summer was gone finding a new place. This time we had a checklist of what we wanted. A washer-dryer hook up and a patio featured on top of our list as did a covered parking. But when budget dictates, you gotta make compromises. Our new abode is a cute town-home in a quite neighborhood. It is a multilevel space. We now have a small finished basement, good enough to be Sid's playroom and also double up as a guest bedroom; a decent sized unfinished area which is our laundry room and storage; a tiny backyard; and the best of all 2 and a half bathrooms. Honestly that what sealed the deal! It ticked off a lot of items on our checklist but we did have to compromise on the covered parking. The days of scraping ice off the windshield is not yet over! Packing and moving was always a big part of my life. My Dad had a transferable job and we have always been on the move. Me and Sam have moved 4 houses in the first 5 years of marriage. The 3 yrs and 9 months that we stayed in our last house, was the longest we stayed in one place. Even with all its challenges, leaving that apartment was hard on me. But packing up that tiny house was even harder. I couldn't believe that stuff I had accumulated. Earlier, I always had professional packers and movers to wrap up everything. This time it was just me and Sam. It was tough, tiring and stressful. The new house though cute came with a lot of work. The property was not in use for a long time. The landlord did replace the carpets and gave it a fresh coat of paint, but it still need some TLC... actually a lot of TLC. The appliances were filthy. The oven had a thick layer of grease. The counter was spotty and the cabinets dusty. And lets not even start on the bathrooms and the backyard weeds. It required a lot of work to make this house habitable. Since every cloud has a silver lining, some good came from this extensive house cleaning operation. For the longest time I wanted to go green with my cleaners. And this situation presented me with that opportunity. Most of the cleaning was done by my DIY all natural cleaners. And they work as effectively as the chemical laden ones. I will be sharing my experiences with these cleaners very very soon. The decor of our last home was very minimal. The walls were bare and the furniture very basic. But when we moved to this new place, all I wanted was to deck it up. But the whole shifting process was not only tiring but expensive as well. Certain unexpected but unavoidable expenses threw us completely off track. That $150 paining I had my heart set on or that $40 antique gold vase I loved so much will have to wait. But can I wait? I started searching for "decorating your home on a budget" and then the whole world of Do It Yourself or DIY opened up. I stepped into the world of spray paint, mod podge foam brushes, primers and sandpapers. Amazed, thrilled and excited, I could not wait to get my hands dirty. My first DIY was a disaster. I tried to spray paint a glass bottle. Thankfully Sam stepped in and salvaged it. Its not perfect but serves the purpose. My subsequent attempts were less eventful and came out almost as expected. I am planning to start a series called #DIYTuesdays, where I will share my DIY crafts. Lets see how long the series continues! Most of you, who have been following me for sometime knows that I am an avid baker too. Though I do not do it professionally, I do make custom cake for my friends for any special occasion. Most of my Indian friends find the American cakes too sweet and the frosting too greasy and heavy. I do too. The USP of my cakes are that they are light and spongy and mildly sweet and the frosting is light, airy with just the right sweetness. 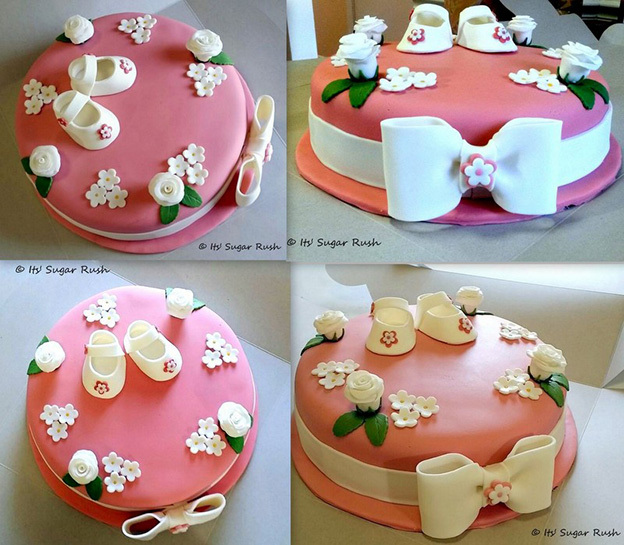 You can see (and follow if you wish) all my sugary creations on my FB page Its' Sugar Rush. A lot of kids from our Bengali community graduated high school this summer and I had the privilege of making the graduation cake for two such bright young boys. I also had the honor of making the baby shower cake for a wonderful friend. Here are some shots of the cakes I made this summer. 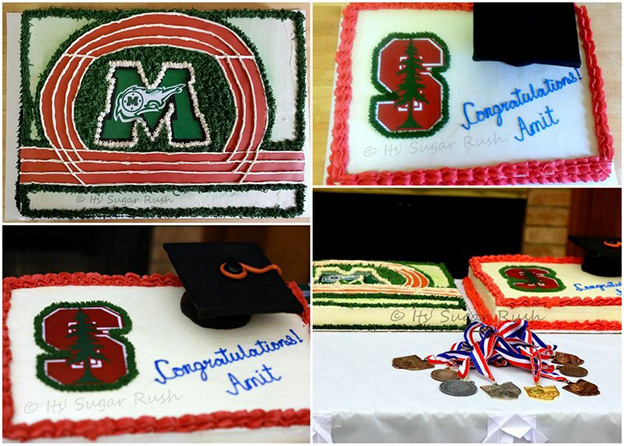 Made these Graduation cake for a brilliant student and a star Track and Field athlete who is on his way to Stanford University. 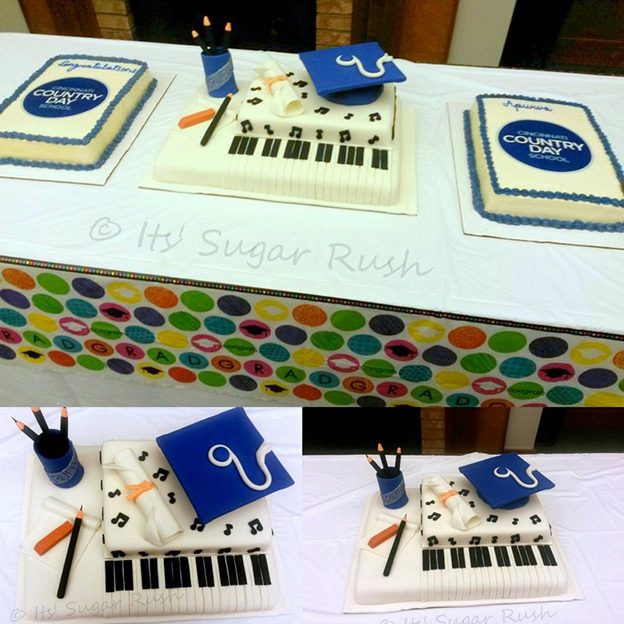 Made this Graduation Cake for a charming young lad, a wonderful pianist and an extraordinary sketch artist. Made this for a friend, who's expecting a little Princess! Between packing up the old house and setting up the new, three gorgeous cake orders, satisfying DIY crafts and responsible DIY all natural cleansers, it was quite an eventful summer. Not as planned, but still very satisfying. Now that Sid will be going back 2 school in a couple of days, I think I can start ticking off my to-do list. Hope you'll had a great summer too.